Wow . I know that might not be the most eloquent review you’ve ever read but still: wow. Not satisfied? 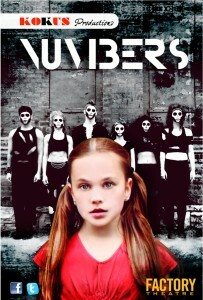 Well I dare you to go see Kokus Productions’ of Numbers at the Factory Theatre as part of the 2012 Toronto Fringe and think anything else. I’d call this a dance piece, but that would be massively oversimplifying things. Then again, I’m not sure how to communicate the way co-directors Lukas Press and Rebecca Reinhart managed to weave together narrative, storytelling, singing, acoustic guitar, historical facts, live painting (by local artist Rhonda Nolan), and oh yeah, did I mention the dancing? It’s a tough call to say whether you’ll leave remembering the narrative that unfolds or the dances that heighten it more. The story follows a young girl in Poland before, during and following WWII. Played with heart by Ella Ballentine, our first couple of encounters with her are a little awkward (at times I felt the vocabulary used didn’t really match that of an 11 year old girl’s). Ella really hits her stride though when recounting one of her grandfather’s jokes, showing a mastery of shtick any Jewish Bubby would be proud of. From there we follow her highs and lows, as her family’s story becomes interspersed with dances of a variety styles. While I thought all were excellent, the opening jive, and hip hop routine to Lil Wayne’s OMG set in a brothel were the two most memorable numbers for me. The stellar cast of dancers aren’t simply relegated to the background however, as each in turn is given an opportunity between scenes to address the audience with facts about the war and Poland’s place in it. It’s not often you get to see a uniformly excellent company of this size, and while I’d love to name them all for you, space limits me to what I felt were two standouts in Natalie Dee and Davin Furtado. I can pick these two out, however Costume Designer Ghada Hamadani didn’t always make that easy. Her choices in costumes at times hid the dancer’s identity in favor of promoting the company as a block. The anonymity this provided however was appropriate for a piece of this nature, and made some scenes easier to watch for those that may have difficulty with some of the subject matter related to the war. Growing up as a Jewish boy, I’ve had plenty of schooling in all areas related to this historical period. To see it presented in such an accessible and artistic way however, left me personally speechless for quite some time. As I passed her on my way out of the theatre, I couldn’t help overhearing a woman repeating the word ‘unbelievable’ over and over. Perhaps that’s a more eloquent qualifier than my simple ‘Wow’, but either way you only have 5 more chances to catch this amazing piece, so do it while you can. Showtimes are: July 6, Friday, 7:00 pm; July 7th, Saturday, Noon; July 9th, Monday, 6:45 pm; July 11th, Wednesday, 11:00 pm; July 12th, Thursday, 5:45 pm; July 14th, Saturday, 5:45 pm; July 15th, Sunday, 1:45pm.